While Hegel’s political philosophy has been attacked on the left by republican democrats and on the right by feudalist reactionaries, his apologists see him as a liberal reformer, a moderate who theorized about the development of a free-market society within the bounds of a stabilizing constitutional state. This centrist view has gained ascendancy since the end of the Second World War, enshrining Hegel within the liberal tradition. 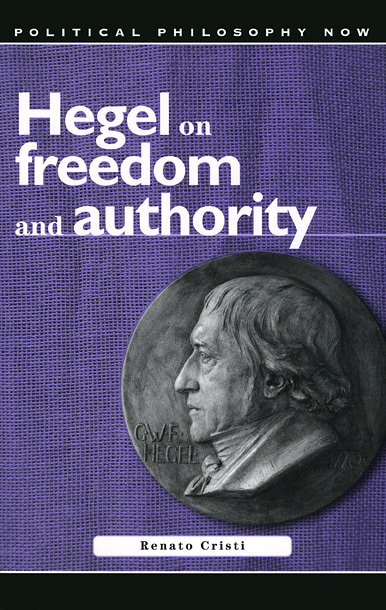 In this book, Renato Cristi argues that, like the Prussian liberal reformers of his time, Hegel was committed to expand the scope of a free economy and concurrently to ensure that the social practice of subjective freedom did not endanger political stability and order. Aware that a system of mutual advantage failed to integrate the members of civil society and that profound social disharmonies were ineradicable, Hegel adopted the views of the French liberal doctrinaires, who sought to realize the principles of the French Revolution by supporting Louis XVIII’s sovereign assertion of the monarchical principle. Not surprisingly, Hegel hailed the French Charte of June 1814 as a beacon of freedom. Endorsement of the monarchical principle was meant to prevent the atomized individuals of civil society from gaining control of the state through appeals to popular sovereignty. This challenges most conventional interpretations of Hegel’s theory of the state and draws it closer to the conservative-authoritarian end of the political spectrum than is usual.